Why Eat Grass Fed Meat? Lavender is one of our primary pursuits here at Lamborn Mountain Farmstead. All of our lavender is grown locally using organic and biodynamic principles. 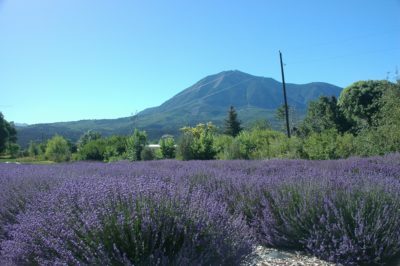 Lavender grows particularly well in the dry Colorado climate. Our high elevation, 6200 feet, makes for a high quality essential oil that we distill from the flowers right on our farm! We use the oils in our products and it is also available for sale. Other products made from lavender include: goat milk soap, lotions, dried and fresh bouquets, sachets, natural bath powder, culinary lavender buds, lavender tea mix, and more. We sell at the farm, through local outlets and at festivals. We are a charter member of the Lavender Association of Western Colorado. The lavender begins blooming in late June and is in full bloom in early July. We begin distilling in mid July. Come visit us during one of the open farm days or call us to schedule a visit.